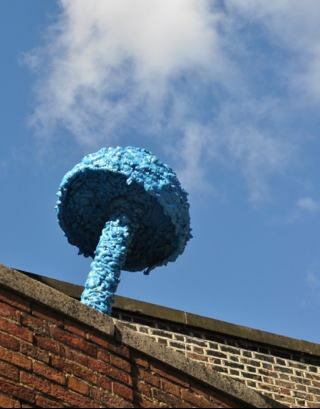 Since 2009 street artist Christiaan Nagel has placed over a hundred giant mushrooms on derelict rooftops around the London’s East End to be enjoyed and photographed by passers-by. He is one of a growing band of painters, stencilers and sculptors bringing vibrancy to the recession-tattered streets of Britain. Unauthorized art in public places is booming in austerity Britain, as public funding dries up, businesses struggle and economic uncertainty hits collectors’ pocketbooks.